Don't forget that our next meet-up is Friday, April 2nd. We're meeting at Jason's Deli on 150 (across from Chick-Fil-A in Hoover) at 11:30am. If you need to be late, that's okay, because we're usually there for quite a while! Be sure to RSVP on this post (or the original post) if you can be there, and feel free to send this to any other Alabama bloggers/social medialites out there! The Twitter hashtag is #AlaBlogMeet. My girlfriends and I try to do something together every so often. We have been friends since highschool, and since we graduated almost 12 years ago...that is really saying something. We don't talk on the phone everyday, we all have very busy lives, but we make that time to get together, to refresh our spirits. Sometimes you just need a time out from being Momma, Wife, Girlfriend, Daughter, and Sister. 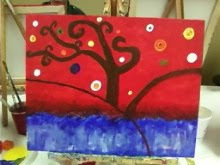 We decided to try something new last night, and we headed out to Corks and Canvas. They are all over Alabama now, and under different names (Sips and Strokes is another). For the $30 pricetag, you can BYOB (in my case it was sweet tea) and snacks, and then you are instructed in reproducing a piece of art work. 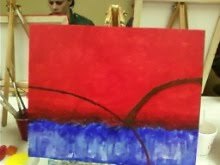 All of the supplies are included, and you have an instructor available who is painting along, answering questions, and assisting as needed. This is the original painting. With The Waves by Natasha Wescoat. I LOVE it...its so colorful and adventurous. 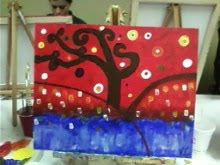 Well...our painting that we were recreating was based on With the Waves, and it was entitled Funky Tree...because lets face it, that is what it was. Over the course of two hours, my girlfriends and I put our own creative stamp on this picture. We talked, munched, laughed, compared our masterpeices in progress, and generally had a great time. 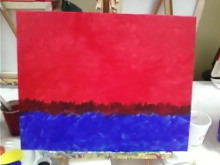 Step One....The red, the blue, and the melding of the two. Step Three...We penciled in our tree, painted the tree, and then added our circles. And Voila! My finished product. Funky Tree a la Kristen. 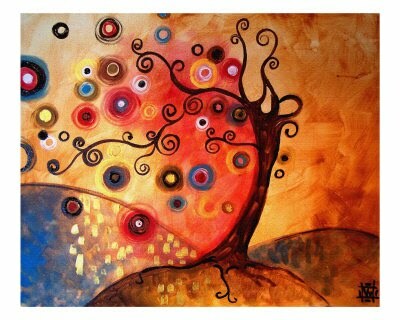 We added the colorful brushstrokes at the base of the tree to represent the leaves, and I outlined my tree in black. Its not exactly perfect. But this is the first time that I have picked up a paintbrush to do anything other than painting a room...so I think I did a pretty good job. We all had such a great experience, and time FLEW by...it was pushing 9pm before we knew it. 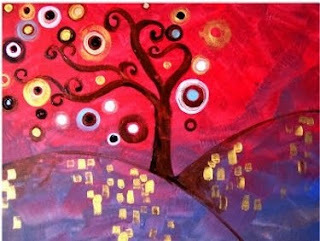 This is the perfect activity for date night, or for a group of friends to get together and have a good time. And when you go...come back to tell us about your experience, and show off your MAD skills! The main reason that I created Alabama Bloggers was to introduce all of us to each other. I have found such value in the relationships that I've formed with other bloggers around the world, and I wanted the same opportunity to do so within my state. Since there seemed to be no other centralized meeting place, I created one. I have most definitely built relationships with more Alabama bloggers, and I know a lot of you have done the same. But unfortunately, I don't have time to visit all of you. 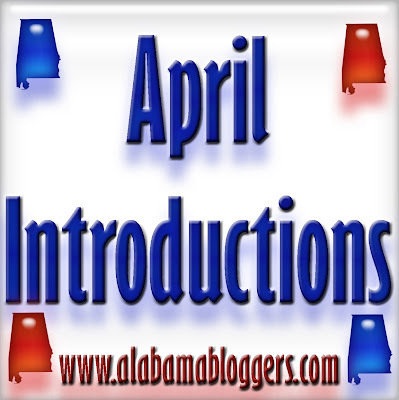 As the one year anniversary of this site approaches, I wanted to maximize the original purpose of it and set aside the month of April each year to spotlight individual Alabama bloggers by giving us all a chance to introduce ourselves. Then at the end of April, I'd like to run a carnival of some sort, like we did at the beginning of Football Season last year. If you have any ideas for a theme for the carnival, let me know! So, if you'd like to write a post about you and your blog, I would love to run it as a part of April Introductions! Where are your favorite places to go in Alabama? Where are your favorite places to visit in the Southeast? Who are some other bloggers that inspire you? If you'd like to participate, please let me know! Simply email me your post (preferably in html, which you can get by writing it in your blog, then viewing the html and copying and pasting) to rachel@alabamabloggers.com, and I'll schedule it and let you know when it will go up! Well...I'm more like an awesome heater-upper. And taker-outer. But I would like to become an awesome cook. Stephanie Parker at Plain Chicken is a self described "accountant by day, amateur chef by night." She kicked off her blog in November 2007 with very little fanfare and a recipe for Toasted Pecan, Caramel, Butterscotch Oat Squares. I approve of all of those ingredients. Plain Chicken covers every type of recipe including desserts, sides, appetizers, entrees and 38 posts labeled "Bread." Hello new best friend. Stephanie also features her cats Jack, Marmalade and Sherbert on Mondays. I'm fairly certain they're just for show. Older generations possessed such creativity. I think life forced them to be more creative. Things just weren't as readily available and life wasn't as "easy" as it is now. Here in the South I think our food shows that creativity. Especially in our small southern towns. Today I'm going to introduce you to something I think you will turn your nose up at. 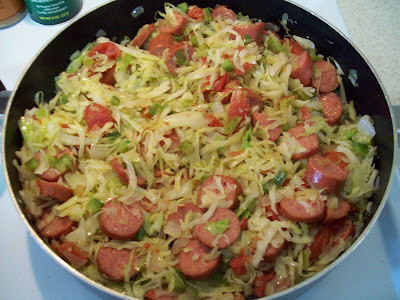 I'm not judging because I did the same thing when someone first introduced me to this food concoction. It was in the late 1930s or early 1940s that Mrs. Tillie Chappell and Mrs. Hugh Neighbors Sr. came up with what is called Ribbon Sandwiches. What is a ribbon sandwich you ask? Well hold on and don't turn your nose up just yet. First you take a slice of bread. Then you spread peanut butter jelly on it. 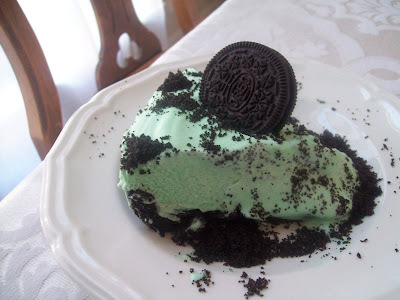 Then you take another slice and place on top of it. 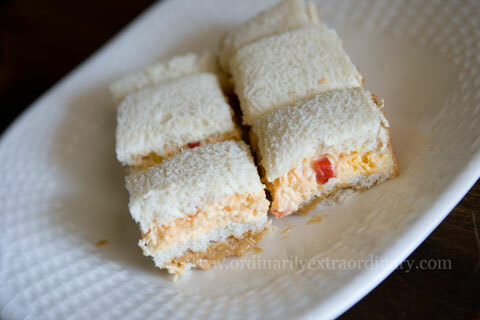 Then spread homemade pimento cheese on top of it and top it with another slice of bread. Yes friends you read that correctly. Peanut butter and jelly and pimento cheese. This photo is my attempt at Ribbon Sandwiches. Usually they are sliced in long thin strips. 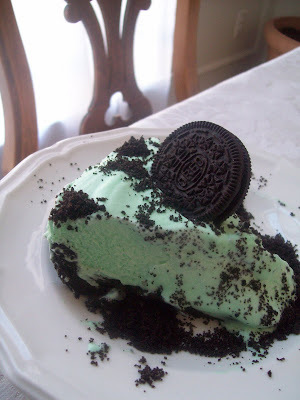 When I first heard of this strange creation I thought how in the world could that possibly be good? I tried my first one a few months ago and it's really not that bad. No it's not something I would make for myself, but they don't taste as horrible as they might first sound. 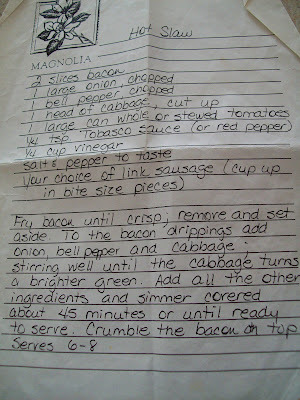 I spoke with Mrs. Tillie Chappell's granddaughter to get some more information about Ribbon Sandwiches. Her grandmother and Mrs. Neighbors were having a Ladies Tea at the First Methodist Church and it was all they had on hand. Thus the creativity of southern ladies. Mrs. Chappell and Mrs. Neighbors used apple jelly when they created the first Ribbon Sandwiches, but today people use either grape of apple. 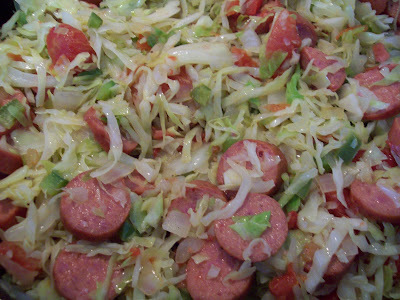 They are served at many showers and special occasions, but can also be found at summer picnics, tailgating or packed in a lunch for a long boat ride on the lake. In 2004 The Great American Race stopped in our town. Many city residents had organized some refreshments for them and served Ribbon Sandwiches. The participants loved them and our town was voted best hospitality for that year's race. You just never know what you will experience living the small town life. The food concoctions of ladies from 70 years ago might make you wonder, but you have to admit they were definitely creative. So what sort of small town creativity have you experienced? Because this is a time-sensitive prize, it is imperative that you contact me at rachel@alabamabloggers.com by FRIDAY (March 26th) to claim your prize. I will email you as well if I have your email. If I don't hear from you by then, I will find a different winner so that the tickets can be used. Please email me your mailing address so that I can get your CDs to you! I recently had the opportunity to try out the new Shonos Japanese Grill located in the Old Walmart Shopping Center on Highway 31 (formerly Cici's Pizza was there). My parents had been telling me about the place and about Eddie, the owner. First, let me go on record as saying I LOVE Japanese food. I could eat it everyday, but in doing so I would break the bank. Why is Japanese food so expensive? I don't get it. However, at Shonos's, you and your wallet are in luck. Shonos is not the typical Japanese restaurant where you are seated at a large table with a bunch of strangers and the food prepared in front of you. AT Shonos Japanese Grill it is just that, a grill. Almost a Japanese Restaurant meets American Diner. When you walk in the door, you will first notice the grill in front of you, with owner Eddie carefully preparing orders. I went at lunchtime and the place was packed. We were seated in the back at one of the last 3 tables that remained. A quick look over the menu and I was relieved. Diners can order a la carte or as the entree. I stuck with my usual Japanese fair, the vegetable entree' for $5.50. Soon my garden salad with the ginger dressing was delivered. I found it to be very good, though somewhat heavy on the ginger, but very tasty. While I ate, I noticed the table next to me receiving their meals. I turned to my lunch companion and asked, "Do you get ALL that food?" "Yes! ", she insisted. As I finished up my salad, our meals were brought out. It looked delicious. My meal of vegetables contained grilled teriyaki vegetables, containing zucchini, squash, mushrooms, onions and bamboo shoots. Also on my plate was a large helping of perfectly steamed rice. You have the option to order the steamed or fried, but I get the steamed because I am not fond of the egg in the fried. Though, I noticed my companions plate. Her rice appeared to not have any egg in it. She agreed that there was not any. I sampled hers....lets just say next time I will get the fried. It had a great flavor. She ordered the chicken entree at $5.95, and received all that I got on my plate with the addition of a hefty portion of chicken, for only 45 cents more. WOW! If you are not looking for a large meal, as mentioned, al la carte is the way to go or there are some smaller dishes on the menu, such as the Teriyaki Bowls. The bowls are served with rice and the meat. 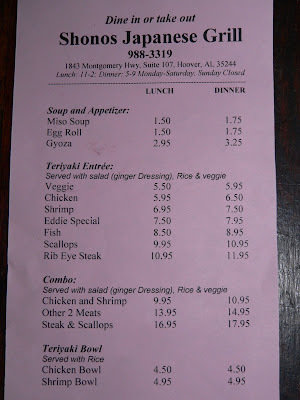 The bowls are available in shrimp or chicken for 4.50 and 4.95 (shrimp) respectfully. The menu offers a great selection of choices. The only drawback to me was the absence of the ginger and mustard dipping sauces that you will find at the larger more upscale Japanese Restaurants. My friend did ask for a "white sauce". I tried it and found to be OK, but was certainly not the dipping sauces I craved. I do plan to go back. When you do go into Shonos, be sure to chat it up with Chef Eddie. He is a funny man and has 27 years of experience in the business. 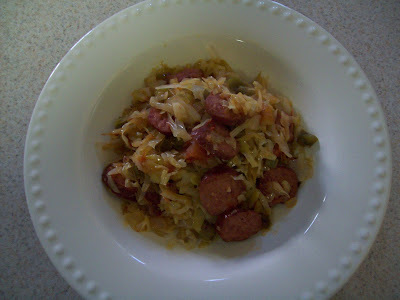 He has lived all over, cooking up these delicious and affordable meals. Donna The Buffalo at WorkPlay .. and Music and Tickets Giveaway!! If you've never had the chance to enjoy a concert at WorkPlay, you must find an opportunity. The intimate atmosphere (which even includes some cozy BOOTHS in the back! ), the sophisticated set-up...it's amazing. It's definitely one of my favorite date locations in Birmingham. And, a show is coming to town that sounds like a great fit for a night of relaxing at WorkPlay! Donna the Buffalo's eclectic and often socially conscious music has it's base in traditional mountain music and is infused with elements of Cajun/ zydeco, rock, folk, reggae, and country. The group’s core are vocalists Tara Nevins, who plays fiddle, guitar, accordion, and scrubboard, and guitarist Jeb Puryear. Keyboardist Dave McCracken, bassist Jay Sanders, and drummer Vic Stafford complete the ensemble. Donna the Buffalo represents one of the most respected brands in the world of touring roots acts. For 21 years DTB has performed feel good, infectious music that often moves listeners physically and spiritually. In the words of a longtime fan, "Their songs are well known to contain lyrics offering poetry and sage commentary on the attractions and struggles with love and politics in this life. Their magnetic musical mix has often been described as dance music, and, for sure, there is everything from foot-tapping to get-up-and-feel-ecstatic moving in their sound; but there is also some deeply satisfying solace in what DTB has to say and how they say it. The dynamic songwriting tandem of Jeb Puryear and Tara Nevins have penned over 140 songs in their collaboration with DTB." If you would like to win one of two copies of the Silverlined CD OR one of two pairs of tickets to the concert, leave a comment here! BE SURE TO NOTATE if you'd like to win concert tickets, as I know not everyone would be able to attend and I want to make sure to only include those that are in that drawing. This giveaway is open until Monday, March 22nd, and the four winners will be randomly chosen and announced on Tuesday, March 23rd. Hello, I am Jessica or the author of Thoughts of a Bama Belle. 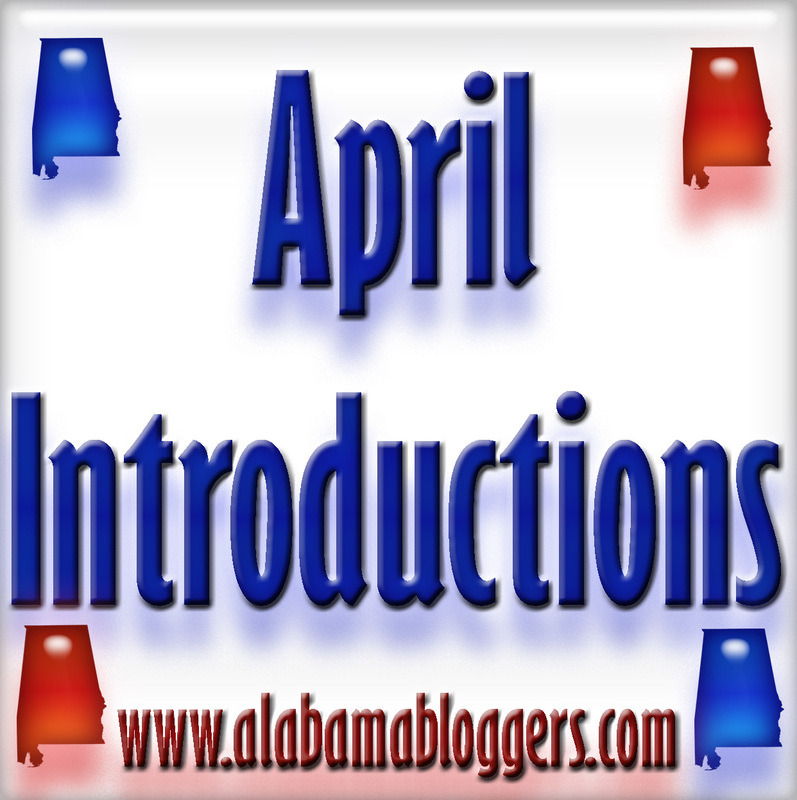 I am so excited to be contributing to Alabama Bloggers! My blog is mostly about real life entertaining, family, and life. Please join us for lots of ideas on holiday treats! 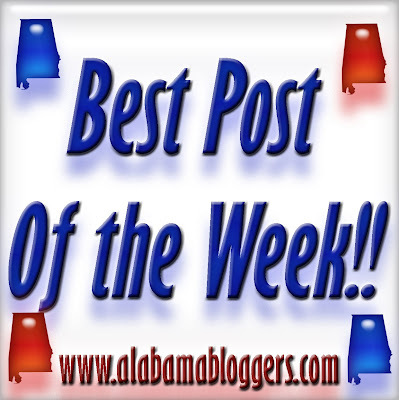 I hope you will all enjoy our time together here at Alabama Bloggers. I want to show that you can create beautiful meals and treats for your family. 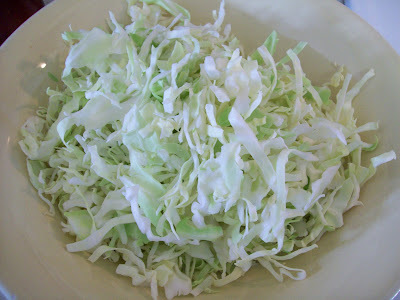 Stir well until cabbage turns a brighter green. Crush cookies and set aside 1/4 cup of crumbs. Place remaining crumbs in a medium bowl and mix in melted butter. Press mixture firmly into bottom and sides of a 9 inch springform pan or pie plate. 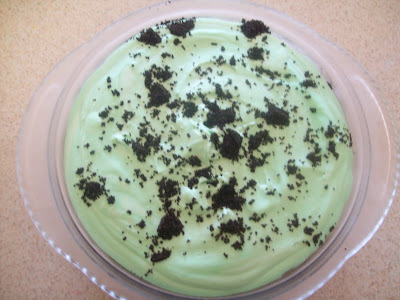 In a large mixing bowl, whip together marshmallow creme and creme de menthe until smooth. In a separate bowl, whip cream until soft peaks form, then fold into marshmallow mixture. Pour mixture into pan and sprinkle reserved cookie crumbs on top. Freeze at least 2 hours, until firm. 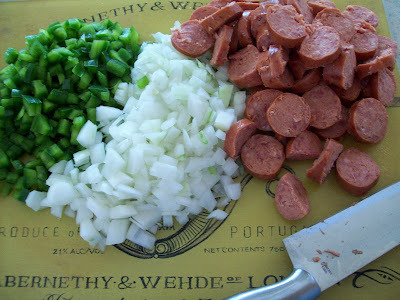 Remove from freezer 20 minutes before serving to soften slightly. I’m going to share pics of the Gaylord Opryland hotel in Nashville. I’m sure many of you have visited here before, but in case you haven’t, it’s quite the astonishing place. I first visited the Opryland Hotel back in 2007 when I was in Nashville for a Deeper Still conference, so if you’d like to see even more pics, click on that link. You almost have to see it to believe it, but hopefully you can get an idea of the magnitude from these pics. They really do treat their customers so well and we felt pampered and pleased at the time we spent there. It’s all indoors, but the amount of greenery and plant material inside is just amazing. I’m sure they must have a host of gardeners taking care of all of this and everything is SO lush and verdant. So, just enjoy the tour…. Ponds and fountains are abundant. And the flowers are so colorful and pretty, you almost think it’s Spring in there. And you almost forget that you’re inside a microcosm since it feels like your outside, only….you’re NOT. We were shocked when we stepped outside to leave at the end of the conference to discover it really was 32 degrees outside. One of our lunches one day was at Ristorante Volare and it was like being in an outdoor cafe in the Mediterranean. Simply heavenly! Lunch was just delish, a wonderful pasta dish. And dessert was amazingly yummy too. They fed us well at the Opryland. The view from our room wasn’t bad either, a pretty courtyard and small pond. Thanks, Rhoda! Rhoda's full article can be viewed here. Be sure to go visit them and welcome them!! Also - if you haven't categorized yourself yet, don't forget to do so! Send Your Kids to an Art Camp Where They Can Play in the Mud! Cahaba Clay Works and Earthborn Studios are offering a kid's art camp (ages 8-12) everyday from 10 am to Noon during the weeks of June 7-11 and July 12-16. Each child will bring home five finished creations by the end of the week. The camp is only $125 per child. ($25 discount for siblings). *Learning how to throw a pot, glaze and bring home their fired piece at the end of the week. *Making a folk art wall hanging with acrylic paints -learn about what makes a folk artist different and what they typically paint. *Creating a tile relief out of clay. Ready to hang on the wall by the end of the week. *Throwing a mug they can drink out of. Add a funny face to it and laugh while drinking your hot chocolate. *Sketching with pencil and paper their self portrait. Enrollment is limited - call 205-702-7055. There will also be plenty of artisan pottery for mom to look through at discounted prices. Also, Adult classes and Mom and Me classes are offered Tuesdays and Thursdays all year long. I had the opportunity to take one of these classes, and had an amazing time! To read more about my personal experience with pottery class, click here. Cahaba Clay Works and Earthborn Studios are located in Leeds. Call or go to their websites for directions. Disclosure: I was not compensated in any way to post this information. All opinions are my own. I know that everyone doesn't like putting their blog in a niche, and that is CERTAINLY okay with me. However, it's also nice to find blogs in certain niches when you're looking for them, so I've decided to offer a new way to organize the Alabama Blogs: by category. If you don't see the category that you feel that you fit in, let me know! I'll be glad to add it! However, if you do, simply add yourself to the appropriate linky, and be sure to check others out in your same category! Feel free to add yourself to more than one category!!! Please let me know if you want me to add a new category - I'll be glad to! March has gotten away from me much quicker than I expected it to! So I'm pushing our next meet-up out to Friday, April 2nd. Everyone really seemed to prefer meeting in Hoover, so let's meet at Jason's Deli on 150 (across from Chick-Fil-A) at 11:30am. If you need to be late, that's okay, because we're usually there for quite a while! Be sure to RSVP on this post if you can be there, and feel free to send this to any other Alabama bloggers/social medialites out there! While Alabama is home to a few larger metropolitan areas like Birmingham, Montgomery, Mobile and a few others most of our state is made up of the small cities and towns. And as I've mentioned before I live in one of those small cities and over my next few posts here on Alabama Bloggers I'm going to introduce you to my small city and some of the reasons I love it. Small town life can be quite entertaining if you let it. And while quirkiness abounds in any area it seems to take center stage in smaller cities and towns. Last summer I was walking into my chiropractor's office checking email on my blackberry when catching a glimpse of something amiss I look up to find a new character I've never met before in our beloved little city. 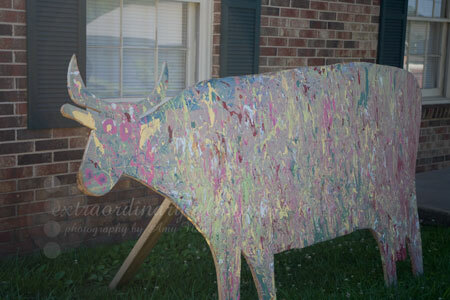 The "Crazy Cow" is a fundraiser by a local church youth group. One morning a business owner will show up to find the crazy cow in front of their business along with a note. The note informs them that in order to have the "Crazy Cow" removed they must pay a certain amount (I think it's around $10.00) to have it moved to the business of their choice. The next morning another business owner is surprised with the oversized decoration. When I asked my chiropractor about it he eagerly looked forward to having it sent to another chiropractor friend of his in town. By the time the "Crazy Cow" traveled its way around town everyone enjoyed many great chuckles at the game and the youth group had raised some funds to help their summer programs. So now I want to know, what are some quirky, small town games and fundraisers that the majority of your town participates in? As I'm dropping by blogs listed in THE LIST - my ADD is desperately wanting. It wants to be captured by some pictures, a great header, or some incredible storytelling. So when I stumbled upon a blog that included recent posts about her Elvis tree, teaching yoga to her toddler and a love for a vintage 90210 notebook - I planted myself in the archives wandering around for days. Erin Shaw Street is an Alabama blogger who gives you glimpses of a very unique, yet normal life. She's a magazine editor by day. And magazine editor by night. She seems to always be writing, but we're the better for it. Her life as a wife, mother, lover of fonts and malls are all simply stories to spin - whether at work or at play. Only four more years of archives to go. A task I'm actually relishing.